Ms. WMSU 2011- College of Social Sciences’ Cristine Bernadette Casanas and Mr. WMSU 2011- College of Communications and Humanities’ Jeffrey Marcos. Jeffrey G. Marcos of the College of Communications and Humanities (CCH) and Cristine Bernadette J. Casanas of the College of Social Sciences (CSS) are this year’s title-holder of the Mr. and Ms. Western Mindanao State University (WMSU) 2011. 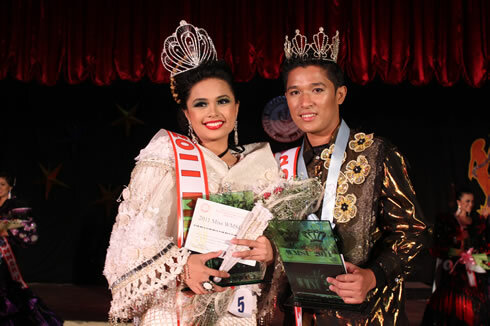 Marcos and Casanas were proclaimed as winners during the Coronation Night held last December 8 at the university’s Dr. Juanito Bruno Gymnasium. 22-year old, Marcos and 17-year old, Casanas triumphed in the competition of beauty, talent, glamour and wits among the 10 male and 10 female candidates of the much attended pageant. The reputable Mr. and Ms. WMSU pageant is an annual event in which young individuals equally endowed with the looks, talent and wisdom represent their respective colleges. The pageant is held in line with the WMSU Palaro every year and is considered as one of the anticipated events. Landing Mr. and Ms. WMSU 1st runners-up were Arbie Bryan N. Imban of the College of Home Economics (CHE) and Sharmaine Gay P. Manlangit of the College of Nursing (CN). Imban was also adjudged as Best in Barong Filipino, while Manlangit brought home the Best in Playsuit award. Proclaimed 2nd runners-up were Darrel G. Navarro (CSS) and Leylanie B. Tajores (CN). Tajores reaped the awards for Ms. Photogenic, Best in Ethnic Attire and Best in Traditional Mascota. Navarro, on the other hand, won the award for Best in Talent. Ms. WMSU 2011, Casanas was adjudged Best in School Uniform. Placing 3rd runners-up were Nomarnico Jahaziel R. Aranal (CN) and Karen B. Ellorimo of the College of Education (CEd). Aranal also received the minor awards for Best in School Uniform and Best in Ethnic Attire. Lastly, adjudged 4th runners-up were Jezreel C. Malapit (CN) and Mariz M. Paradel (CHE). Paradel won the award for Best in Talent among the lady candidates. The pageant also gave minor awards to the candidates who excelled in the following categories: Best in Short – King David N. Bustamante (CEd); Mr. Photogenic- Pervic John M. Solamillo (College of Architecture); Mr. Sun Cellular- Jake Bernard M. Buñol (College of Engineering and Technology); and Ms. Sun Cellular- Cecilia Joyce S. Filoteo (College of Science and Mathematics).